The Irish boss did not rule out Michael Obafemi featuring against Denmark. 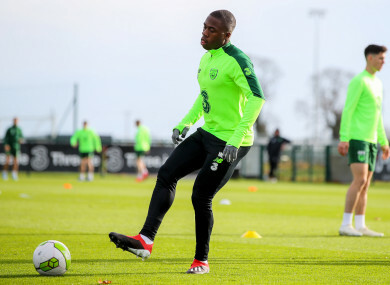 Michael Obafemi trains with the Ireland squad today. IRELAND BOSS MARTIN O’Neill has said Michael Obafemi could feature in the upcoming games against Northern Ireland (15 November) and Denmark (19 November), but said he will have a discussion with the player about committing to the Republic. The 18-year-old Dublin-born attacker, who has featured twice for Southampton in the Premier League this season, is also eligible to represent England and Nigeria. He spent most of his upbringing in London and was raised by Nigerian parents. Should the promising young striker feature against the Danish, he would be tied down to the Boys in Green for the remainder of his career. However, while O’Neill did not rule out Obafemi playing against Denmark, he said he would not pressure the player into doing so and would sit down with him and his family to discuss the matter in the coming days. “He’s in the squad at this minute, he has, obviously, his decisions to make for his future — you would expect that anyway — and I think that’s something he would obviously discuss with his family, so there’ll be no real pressure on him to make that decision in the next couple of days,” O’Neill said at today’s press conference. Asked whether the talented youngster could feature against Denmark, O’Neill responded: “That would the player and the family’s decision to do that. The last thing that you’d want to do is be rushing someone into a situation like that if they are uncomfortable with it. I don’t know if that’s the case — I will speak to him this afternoon — but if he has decisions to make, then I would respect that. With issues of player eligibility and dual nationality increasingly common talking points in international football, O’Neill acknowledged that it was an something he would likely have to deal with again in the future. “Seemingly, it looks as if that’s going to be the case, yes, particularly if a player has multiple choices of where he could play. “If that’s the case and we consider him good enough to be with us, it would certainly be worth fighting for — if ‘fighting’ is the correct word, I’m not so sure that is, but I think you get my meaning. The Irish boss announced his final squad for the upcoming games today, with Derrick Williams and Shane Long both unavailable due to injury. Email “Martin O'Neill will have discussion with 18-year-old Southampton youngster about committing to Ireland”. Feedback on “Martin O'Neill will have discussion with 18-year-old Southampton youngster about committing to Ireland”.